Description of the appearance of the jackets. The range of women's products vest to replace the jacket and is a complement to the costume set. Vests are made in the ensemble with a dress, skirt, pants. 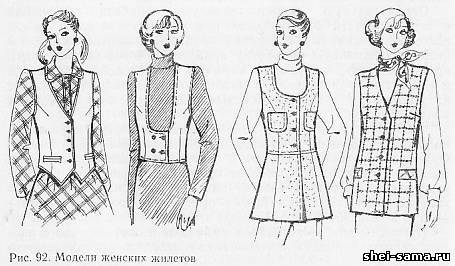 Models of women's jackets varied, they are: Central and offset side-eye closure, lined, unlined, long and short, with a collar and without a collar, with lapels and without lapels, with various pockets (Fig. 92). Parts cut. Consider the details of tailoring the vest on a concrete example. The vest adjacent silhouette with the Central onboard fastener on the lining consists of details of top, lining and gasket. Details of top (Fig. 93, a) cutting of main fabric, they are: shelf - 2, back (two piece) - 1, podbot (two parts each) - 2, piping for the pockets - 4 valances - 2. From lining fabric (Fig. 93, b) dents: shelves - 2, back (two piece) - 1. The details of the strip (Fig. 93) cut out of cotton fabric (calico, calico) with an adhesive coating or without it, these include: construction of shelves - 2, strip at neckline backless a - 1, burlap - 2. The details of the vest is cut out in accordance with specifications for cutting. The shelves warp yarn runs parallel to the side cut. When cutting fabric with stripes strips shall be parallel with the cut side shelves. 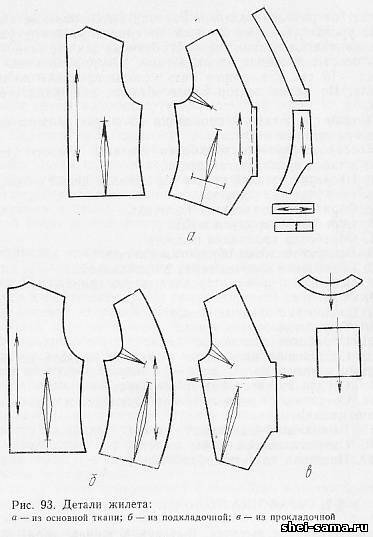 The left side of the vest when cutting make wider right on 1,5 cm In the back warp yarn is parallel to the line joining the top and bottom corners of medium cut backless, podborta - parallel to the outer sections of podborov.Width podborca top 3 to 4 cm, at the level of the ledge to starboard - 5 - 6 seeWhen checking the cut on the shelves I specify the location of control marks, tucks and side pockets. the Details of the lining and the strip on the form must match the detail at the top. 1. Check the details of the cut and the transfer of lines from one symmetrical part to another. 2. Treatment tucks on the shelves. 3. Machining pockets in the frame. 4. Treatment strip the shelves. 5. Wet-heat processing of the shelves. 6. Connection shelves the top gasket. 7. Cutting through and paving edges. 8. Treatment of the back. 9. The connection of the side sections. 10. Treatment of the sides and bottom. 12. The connection of the lining with the top of the vest on the sides, the armholes and bottom. 13. The connection of the shoulder sections top. 14. The connection of the shoulder sections lining and treatment of the neck backless.